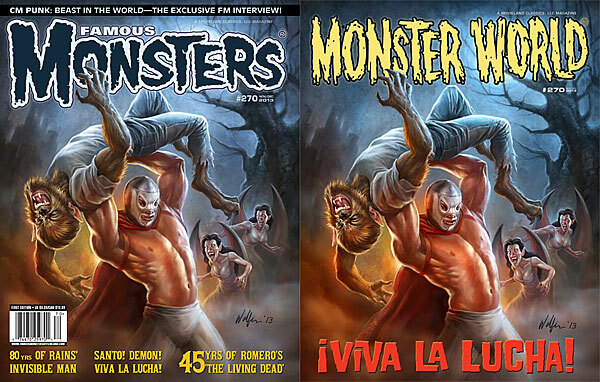 We’ve got some uncirculated copies of the recently released VIVA LA LUCHA issue of the resurrected Famous Monsters of Filmland. 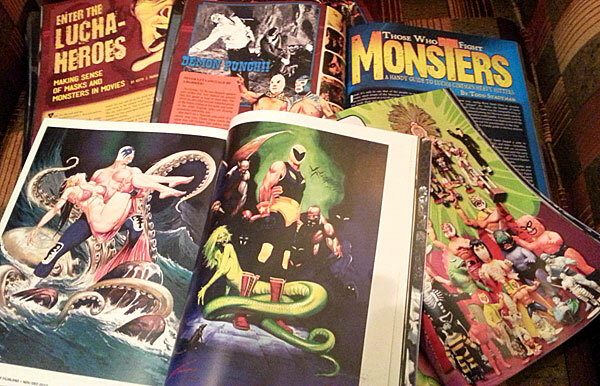 Lucha-hero and Mexi-monster related articles galore here from FPU‘s own Keith Rainville, Mondo Lucha-a-Go-Go author Dan Madigan, Todd Stadtman of The Lucha Diaries, plus Japanese heroes Tiger Mask and Aztecaiser from August Ragone, a horror-themed interview with C.M. Punk, a feature on Ultimo Dragon, the lucha-fantasy pulp art of Rafael Gallur and more! The same issue has two covers, one for newsstand racks with Forry Ackerman’s classic masthead, the other a less-cluttered cover with the old Monster World title (this version is available only in comic book stores). Both versions are in stock, please specify which one you want when ordering. MONSTER WORLD VERSION IS NOW SOLD OUT.